"...Buenos Aires has more bookshops per inhabitant than any other city in the world, according to a recent study by the World Cities Culture Forum. 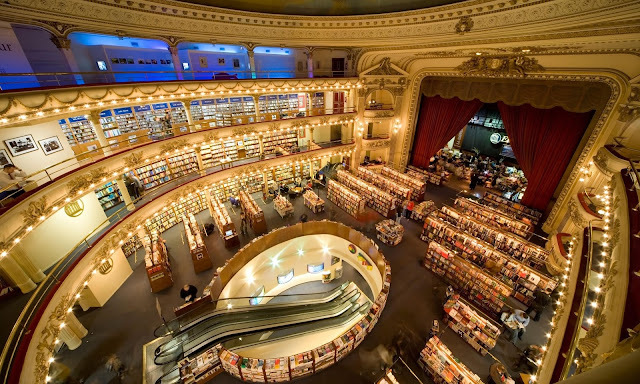 ...opened as a theatre in 1919 and converted into a giant bookstore 15 years ago, the Grand Splendid still boasts the beautiful ceiling frescoes painted by an Italian artist almost a century ago. Around 1 million customers visit it each year to browse through its gargantuan 21,000 square feet showroom, or withdraw into one of the old theatre boxes perched for a leisurely read." More pix of the bookstore. A population of 2.8 million?? just wait until buenos aires gets internet. the same thing will happen to the book stores there, as elsewhere.